Sunday--the only free day for the “monklets”--we go for a hike. and joy is extraordinary. They play with complete abandon, no fears, no rules or regulations, no toys needed, just the wide expanse of the landscape and what they find dead or alive on the way. I continually count, trying to keep track of the robed blurs as some sprint up mountain peaks, only a red dot on the horizon, others play with sun-bleached cow bones we find along the way, while some play as ninja warriors, (and where did they get that?). Our relationship is one of genuine affection, eager to be together, playing, conversing, learning, and laughing. They fill my heart with gratitude and immeasurable delight. 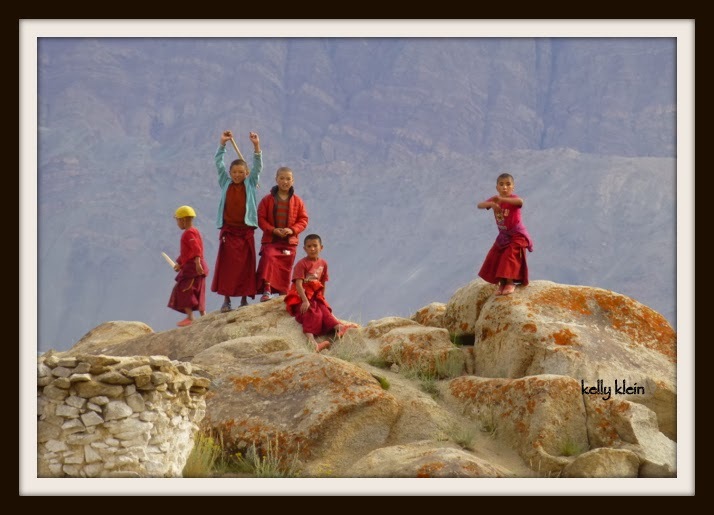 I teach them English, they teach me Ladakhi. Together we explore the stories around the life of Buddha. They teach me to chant, I teach them the magic of books. I have found my place again; sharing all that I am, I receive so much more than I can ever offer. Thanks so much Jenny! And thanks for welcoming me to South Africa! See you soon..